No matter how much we all love our furry, feline friends, there’s one thing that none of us likes dealing with: the dreaded litter box. It’s something you may not have to deal with if you have an outdoor cat, but for all those indoor cat owners the sound of their pet scratching in the litter is something we dread. That’s why we’ve gone in search of the best self cleaning litter box. These units are a god-send for anyone that can’t stand cleaning poop or clumps of waste out of the litter box. And let’s face it, that’s pretty much everyone. There’s a huge variety of units on the market with a wide array of different features. Those that are a priority for some may not be important to others so it’s important to prioritise the features that matter to you. They can also vary wildly in price so it’s essential that you know what to expect before you make your purchase. We’ve attempted to compare the best models below. The latest version of this very popular unit. The first fully automatic cat waste disposal system. Featuring a unique rake and scoop mechanism. Disposable litter trays for minimal fuss. All product data is correct as of August 2016. This unit is the latest version of the highly popular Little Robot range. It’s a product that has a long history and can therefore claim to have ironed out many of the snagging issues you might find with more recently released products. But is it the best self cleaning litter box? It detects when your cat has left the box and initiates a timer which counts down. This gives ample time for the waste to clump before the cleaning cycle kicks in. The unit’s special sifting system then separates the waste from the unused litter before dropping it into the storage drawer. It then returns to its default position with a clean and level bed of litter, ready for the next use. There are many helpful features such as a drawer full indicator, control panel lock out to stop paws and little fingers from changing your settings, adjustable timer, automatic night light for older cats among others. This unit requires next to no setup and you’ll have it unboxed and ready to use in no time at all. The Litter Robot III makes a number of bold claims and if you’re anything like me you might view these with a degree of cynicism. After all, it’s very easy to talk a good game. So how did the unit measure up to the marketing? You immediately feel that this is a sturdy and well constructed piece of equipment. 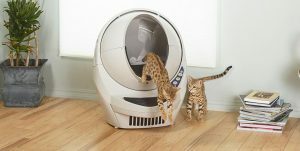 Some competing products can feel flimsy but the Litter Robot III seems very robust. While it’s difficult to describe any automatic cat litter box as “attractive” this one certainly looks like a premium piece of kit with a nice design. 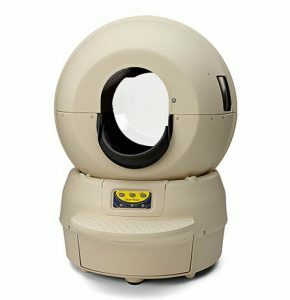 The main difference in design compared to earlier Litter Robot units is the upward tilted globe. This gives the box an “open air” feel and allows plenty of light in. The globe orientation means that large cats can accommodated and this unit boasts more space than previous versions. Overall I can say that my experience with the unit has been very positive. My cat Andrew overcame his initial misgivings and before long he was happily using it. More than that he found the cleaning mechanism particularly fascinating to watch. Bear in mind this is with a fairly skittish cat so that should give you an impression of how quiet and smooth the cleaning operation is. The unit is therefore suitable even for nervous cats. Shipped: 32”H x 24”W x 24”D, 32lbs. 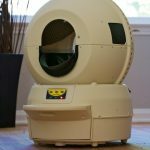 For many years this was the flagship product in the highly popular Litter Robot range and features much of the functionality of the newer model with a few notable exceptions. You can read about these below. Much like the Litter Robot III, this unit contains a weight sensor that detects when your cat has exited the box. The timer then counts down before initiating the patented cleaning process which separates the waste from the clean litter. Waste is then deposited in the drawer below which can be lined with an ordinary kitchen garbage bag. This unit requires next to no setup and you’ll have it unboxed and ready to use in no time at all. Like the Litter Robot III this is an undoubtedly well manufactured piece of equipment. It has a very premium feel to it that immediately instils confidence. Is that confidence justified? For the most part yes. My cat took to using the Litter Robot II Bubble with little difficulty. The entrance was a little narrow, but once he’d negotiated it the first couple of times he found it easy to enter and exit the box. 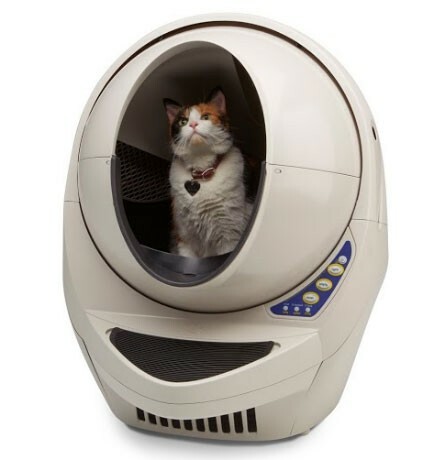 The Litter Robot II has a bubble-shaped window to the rear allowing light into the box, so if your cat is suspicious of enclosed dark spaces you might find that this unit works for you. This unit’s cleaning mechanism itself works effectively providing you take the time to read the manufacturer’s instructions. A good quality clumping litter is recommended as cheaper varieties tend to leave a residue that can clog the rotating cleaning mechanism. You may need to experiment with the quantity of litter required to get satisfactory results. Bear in mind that you will need to periodically top up the litter as the box empties. It is also recommended that you don’t let the waste drawer fill up completely as it is not sealed and can result in odor. With one cat you should probably aim to empty the drawer around once per week. Andrew had no problems adapting to the Little Robot II Bubble. He was able to climb inside with only a little difficulty on the first couple of occasions after which he managed comfortably. For more prolific cats you may find yourself checking the waste drawer periodically, at least in the beginning. Once you get used to your cat’s usage level you’ll know when it needs emptied. All in all this is an excellent unit with only a few issues that can be quickly overcome. This could be a contender for best self cleaning litter box. 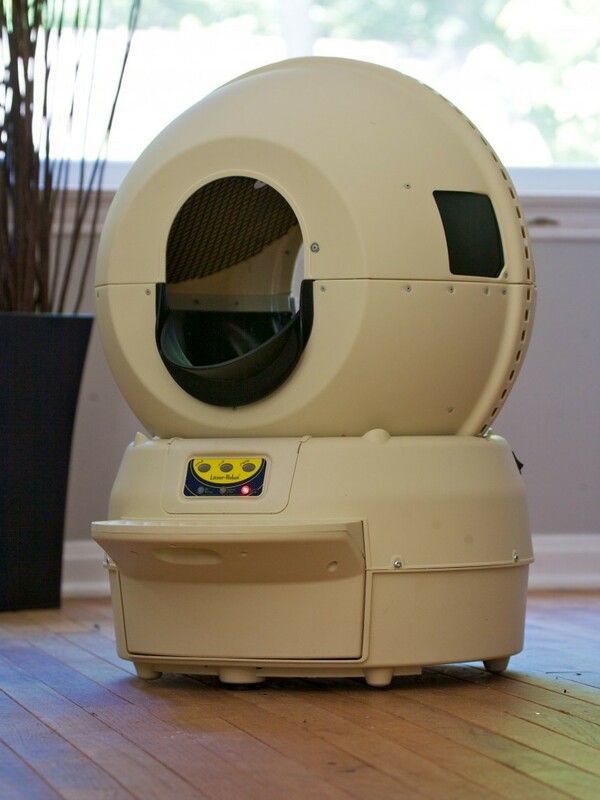 The CatGenie is something of an innovation in automatic cat litter boxes. You might even say that it’s something of a “holy grail”. 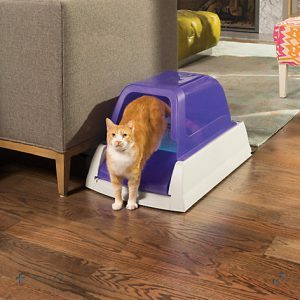 A litter box that completely eradicates the requirement to buy and change litter may seem too good to be true but the CatGenie claims to deliver. 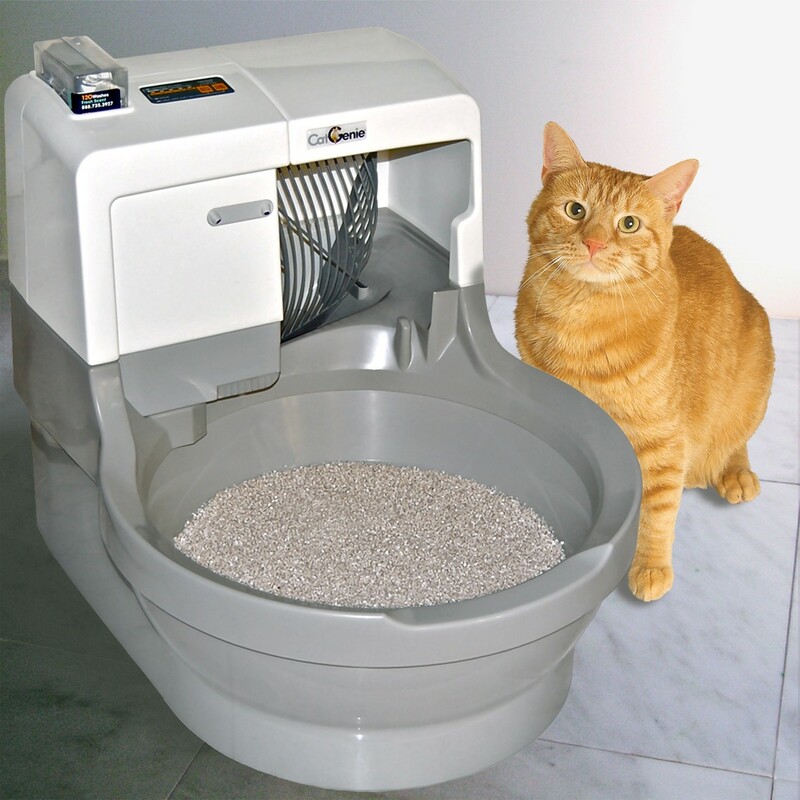 The CatGenie is a self-flushing, self-cleaning cat litter box. It requires some additional set up compared to other units as it needs to be connected up to a water supply and a waste drain. 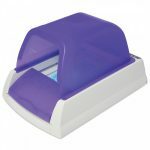 Once connected the unit will detect when your cat has used the box before sifting and disposing of any waste while washing and drying the washable, reusable litter granules. This unit’s self-flushing functionality means there are some added complications and considerations when setting it up. The CatGenie should be connected to a cold water supply line and the kind of waste drain that you might connect a washer-dryer up to. It’s fairly easy to hook this up and the unit comes supplied with T-connectors so you can utilize existing connections. The only tools required are a wrench and pair of pliers. All of this of course limits where you can place the CatGenie. If your cat doesn’t like going into the laundry room or hasn’t yet explored the bathroom then you might want to consider whether this will work for you. The unit is of good quality construction and Andrew had no hesitation in using the litter tray. He does like to scratch around and so there was a certain amount of litter debris around the box. The CatGenie is just an open litter tray in the standard package. However you can buy optional sidewalls which help contain litter from “kickers” and a dome which fully encloses the unit. 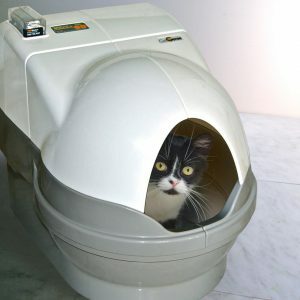 For cats that like total privacy a door can also be added to the dome. Obviously it depends on your cat’s toilet habits but I would definitely recommend at least getting the sidewalls to prevent debris scatter. The CatGenie has a lot going for it. For the most part it does what it says and has many useful features. For an automatic flushing unit it was surprisingly easy to set up. Because of the reusable litter it’s a lot more environmentally friendly than conventional boxes. The cleaning cycle is programmable and can be put to sleep during the night when you don’t want to be disturbed by the noise. With that said, it is pretty noisy. More so than other units in fact. It’s also only suitable for cats with firm stools. If they are soft you may find that they stick to the cleaning mechanism causing an unpleasant odor and leaving you with a clean up job. Could it be the best self cleaning litter box? It’s good, but not perfect. Colors. Base: Pearl Gray, Top: Porcelain White. 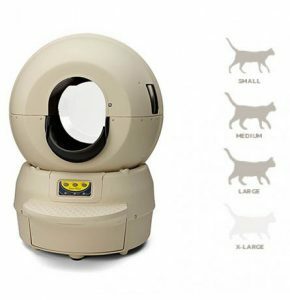 The ScoopFree Ultra might be towards the lower end of automatic cat litter boxes but it still comes with some unique features. This is a very decent alternative to daily scooping and uses a type of crystal litter that comes in disposable trays to reduce odor. 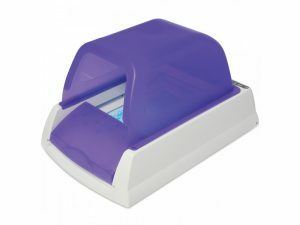 At first glance, the ScoopFree Ultra looks much like some conventional enclosed litter boxes, with a vibrant purple hood. Looks can be deceiving though. The entire bottom of the unit is a disposable litter tray that can slide out when it needs replaced. The recommended lifespan of a single tray for one cat is between 20-30 days although individual results may vary. With two cats that number is halved. Now it isn’t called “ScoopFree” for nothing. This unit features a self-scooping raking mechanism that gathers solid waste into a compartment located at the front of the unit. The raking mechanism can be set to kick in either 5, 10 or 20 minutes after the cat exits the litter box. Andrew seemed suspicious of the silica-based litter at first but he soon overcame that to use the unit with no problems. The litter actually works very well at reducing odor. Unlike clumping cat litter the silica granules actually absorb urine and neutralize the odor. The ScoopFree Ultra deals with solid waste very effectively and doesn’t seem to jam as easily as other units. Waste is raked into the compartment at the front of the box where more silica litter helps to minimize odor. It should be said that the 30 day lifespan of the disposable tray is perhaps a little optimistic. 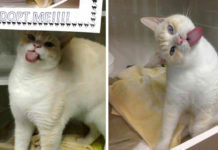 20 days seemed the limit with Andrew and even then it could vary, so you’d definitely want to keep an eye on the state of the litter and whether your cat seemed hesitant about using the box. You should also be cautious in more humid conditions as moist air will definitely limit the lifespan of this type of litter. The litter can be made to last longer by stirring it through and making sure the fresher stuff is churned to the top to absorb urine. The trays were easy to detach and replace and the waste trap wasn’t difficult to empty. There is much to recommend the ScoopFree Ultra. It might not be the best self cleaning litter box, but like most of these machines it isn’t quite the scoop-free Utopia it promises but it still reduces the amount of cleaning you’d need to do otherwise and that must be a good thing. It works well for the most part but shouldn’t be used if your cat is prone to soft stools. If your cat is ultra-suspicious of changes in its environment it might not take very well to the new litter. 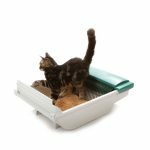 The replacement trays could prove expensive compared to regular litter, but this will depend on how often your cat uses the box. Another automatic litter box nearer the lower end of the market. 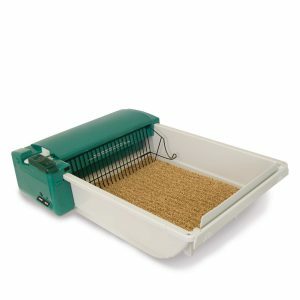 A very reasonably priced litter tray with an electric rake scoop mechanism. Like many other automatic litter boxes, the Smart Scoop is equipped with special sensors that detect when your cat has just used the box. When your cat is finished the unti will wait for 15 mins before initiating the cleaning sequence. Cleaning is achieved by a strong metal rake than sifts through the litter and removes any clumps into the waste compartment. This unit uses disposable bags and features blade mounted fins and steep sides to ensure that litter doesn’t end up spilling onto the floor. Andrew got on fine with this unit. 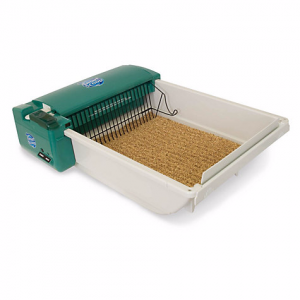 Of all the automatic litter boxes we’ve tested this one is most like a conventional litter tray. The mechanism was a little off-putting at first but he soon adjusted. For the most part this unit worked well. The raking mechanism was able to handle most circumstances and the high sides kept spillage to a minimum. It removed most clumps and left a nice even spread of litter for the next use. There were some issues with solid waste. If your cat is inclined to use the same spot over and over again you’ll find that the corresponding area in the waste trap will fill up quickly. This is a design flaw in most units of this kind. It can also have some issues with clumps that have stuck to the bottom of the tray. This wasn’t too much of a problem as you’d expect to wash the box out periodically anyway. The unit makes use of carbon filters to reduce odor and this worked well. I would, however, note that these filters don’t last particularly wrong. One thing that is absolutely unforgivable is the tiny, tiny electrical cord supplied with this unit. Even if you have it located right next to a power outlet you might find that you need an extension. It’s such a simple issue and one that could be fixed very cheaply. Again, another reliable box that did most of what it claimed to. It did a good job in most circumstances and only really had an issue with urine clumps stuck to the bottom of the tray. It uses ordinary clumping cat litter and plastic bags so there are no special purchases required. The only major problems I had were the short power cord and the lack of a hood. Andrew likes his privacy. So not the best self cleaning litter box but certainly not the worst.